The Midnight Review: Tim Slagle Calls Out Big Government? Article Declares Breitbart A Loser. Tim Slagle Calls Out Big Government? Article Declares Breitbart A Loser. There was a Big Government article by Tim Slagle mentioning Godwin's Law, which states that "as an online discussion grows longer, the probability of a comparison involving Nazis or Hitler approaches … given enough time, all discussions —regardless of topic or scope —inevitably wind up being about Hitler and the Nazis." But I think we should add another corollary to Godwins Law. I think that if you call your opponent a Racist, you have also lost the argument. 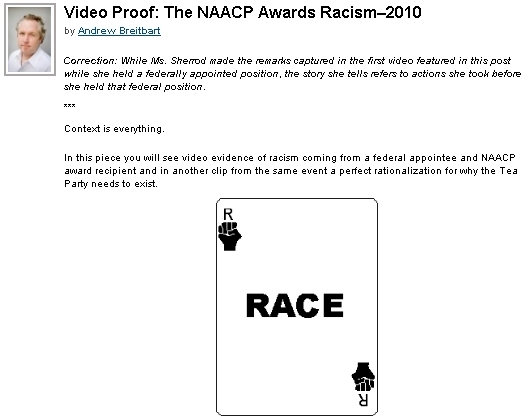 You see, Breitbart made a post on his propaganda site, Big Government, on July 19th, accusing the NAACP of awarding racism - the recipient being Shirley Sherrod. Breitbart posted a truncated video, claiming Sherrod was a racist, and insisting that "context is everything" - he even went as far as to display a picture of a "race card." Breitbart played the race card alright, and now he won't back down, insisting he never meant to imply that Sherrod was the racist in question. Something else of interest - he doesn't even correct his initial post. Sure he put up a correction stating that the alleged racism occurred before she held a position of public office, but he not once put up a correction stating the video was taken out of context.